class="post-template-default single single-post postid-369564 single-format-standard group-blog masthead-fixed full-width singular wpb-js-composer js-comp-ver-5.7 vc_responsive"
Courtesy/ Cozad and Elwood fire departments recently trained with new ice rescue gear. 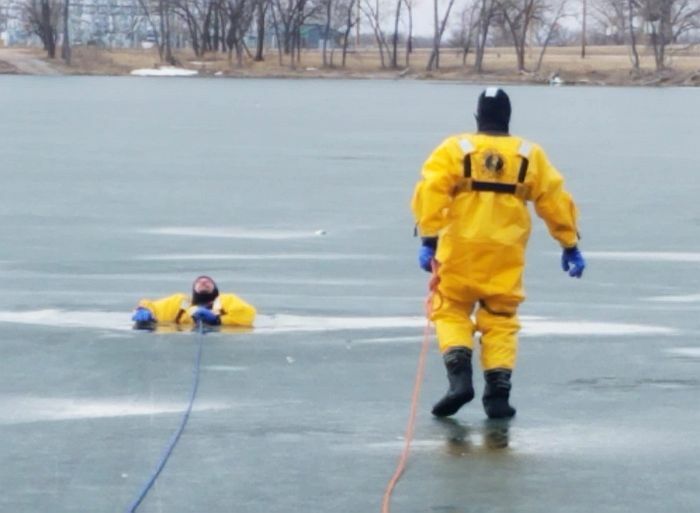 Cozad Fire & Rescue has obtained ice rescue equipment through a $2,207 grant from Central Nebraska Public Power and Irrigation District(CNPPID). Among the items are two Mustang Ice Rescue Suits that are used by the rescuers who go out on the ice or into the cold water to rescue a victim. Assistant Rescue Chief Gary Banzhaf says the suits are waterproof and buoyant to keep the rescuer afloat. The adjustable suits also fit a wide range of sizes of people from 110 lbs to 330 lbs and 5’1″ to 6’3″. Other equipment includes ice picks/awls that assist the rescuer pull themselves along the ice as they law on their belly. Banzhaf says the technique disperses the weight to prevent further break through on the ice. The ice picks/awls are also used by the rescuer to help pull themselves out if they fall through the ice. A ring buoy can also be deployed to throw to the victim to help them attempt to self rescue or to keep them afloat until a rescuer can reach them. Also included in the equipment is a rope bag containing a rope to be thrown to the victim used in rescue, some carbines and D rings used to attach the ropes and a large bag to store all the equipment together. 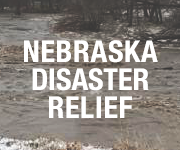 Banzhaf expressed Cozad Fire & Rescue’s(CF&R) appreciation to CNPPID for their donation. He says such donations help fire departments obtain equipment they don’t have. While CF&R previously had “some ropes and some life vests”, Banzhaf says it was insufficient for use in cold weather conditions. He says the new ice rescue suits are insulated, which allows the rescuer to remain warm when they enter the cold water or on this ice “so it means a lot to us to get this” equipment. 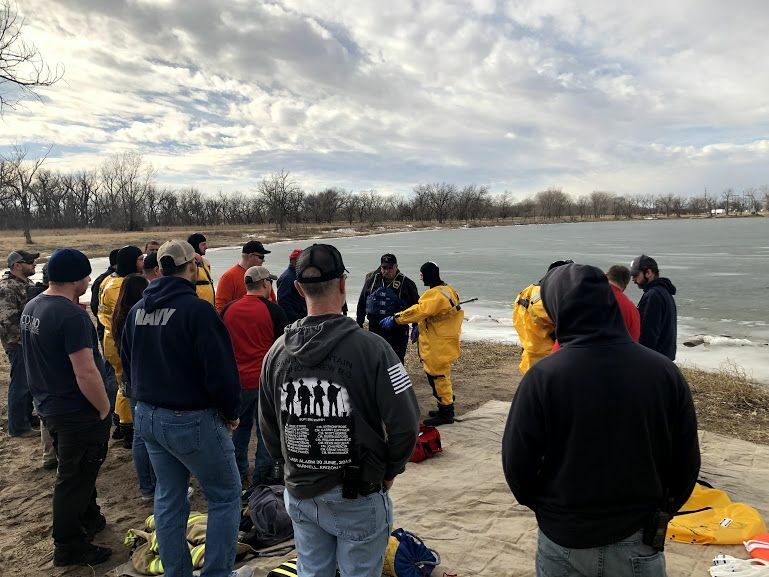 Training on the equipment was recently conducted by the Nebraska State Fire Marshall’s Office at Cozad Lake with Elwood Fire & Rescue, which had previously received similar equipment through a CNPPID grant.